Some of the most common problems in pumping stations, sewer networks and wastewater treatment systems are attributed to fats, oils and grease (FOG). FOG in the wastewater sewerage network blocks pipes, restricts flow and gives rise to network overflows and flooding. FOG also contributes to pump and equipment failures and has an inhibiting affect on the biological treatment processess within wastewater treatment systems. 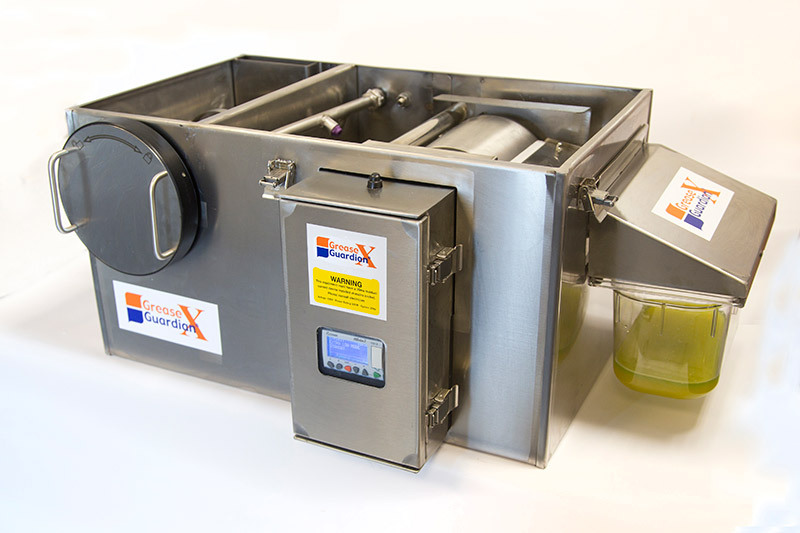 To counter these problems FM Environmental developed the Grease Guardian range of automatic and manual grease removal equipment. Addressing the problem at source – in the kitchens and food preparation areas – the Grease Guardian traps and automatically removes 98% of free-floating grease and oils ensuring the sewer pipework remains FOG free. The compact, stainless steel unit fits neatly in the kitchen automatically trapping and removing grease on a daily basis. Why is it important to treat your Grease?